Republicanism is a form of democracy adapted to the shape of government. Populism is a principle that Mustafa Kemal had presented to the Parliament. Populism: The Kemalist revolution was also a social revolution in term of its content and goals. This was a revolution led by an elite with an orientation towards the people in general. The Kemalist reforms brought about a revolutionary change in the status of women through the adoption of Western codes of law in Turkey, in particular the Swiss Civil Code. Moreover, women received the right to vote in Atatürk stated on a number of occasions that the true rulers of Turkey were the peasants. This was actually a goal rather than a reality in Turkey. In fact, in the official explanation given to the principle of populism it was stated that Kemalism was against class privileges and class distinctions and it recognized no individual, no family, no class and no organization as being above others. Kemalist ideology was, in fact, based on supreme value of Turkish citizenship. A sense of pride associated with this citizenship would give the needed psychological spur to the people to make them work harder and to achieve a sense of unity and national identity. Secularism is the separation of religion and state affairs from each other. Secularism: Kemalist secularism did not merely mean separation of state and religion, but also the separation of religion from educational, cultural and legal affairs. It meant independence of thought and independence of institutions from the dominance of religious thinking and religious institutions. Thus, the Kemalist revolution was also a secularist revolution. Many Kemalist reforms were made to bring about secularism, and others were realised because secularism had been achieved. The Kemalist principle of secularism did not advocate atheism. It was not an anti-God principle. It was a rationalist, anti-clerical secularism. The Kemalist principle of secularism was not against an enlightened Islam, but against an Islam which was opposed to modernisation. Revolutionism is an understanding which gives great importance to the public integration and democratic methods. Reformism: One of the most important principles that Atatürk formulated was the principle of reformism or revolutionism. This principle meant that Turkey made reforms and that the country replaced traditional institutions with modern institutions. It meant that traditional concepts were eliminated and modern concepts were adopted. The principle of reformism went beyond the recognition of the reforms which were made. Nationalism is one of the social factors that contribute to the wealth such as individual rights and freedoms. Milliyetçilik, bireyin hak ve özgürlükleri gibi evrensel zenginliğin artmasına katkıda bulunan sosyal yapılardandır. Nationalism: The Kemalist revolution was also a nationalist revolution. Kemalist nationalism was not racist. It was meant to preserve the independence of the Republic of Turkey and also to help the Republic’s political development. It was a nationalism which respected the right to independence of all other nations. It was a nationalism with a social content. 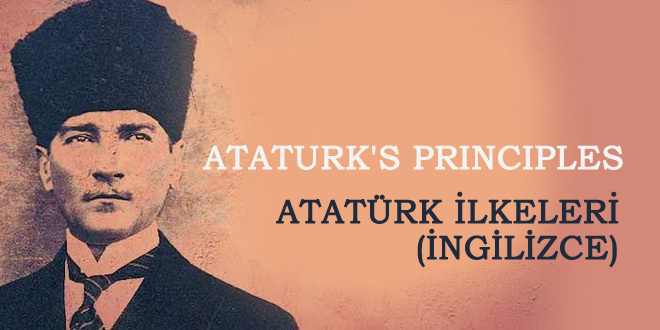 It was not only anti-imperialist, but it was also against the rule of a dynasty or of any particular social class over Turkish society. Kemalist nationalism believes in the principle that the Turkish state is an indivisible whole comprising its territory and people. Statism is a principle which defines the duties of the government on social, economic and cultural development. Statism: Kemal Atatürk made clear in his statements and policies that Turkey’s complete modernisation was very much dependent on economic and technological development. The principle of statism was interpreted to mean that the state was to regulate the country’s general economic activity and the state was to engage in areas where private enterprise was not willing to do so, or where private enterprise had proved to be inadequate, or if national interest required it. In the application of the principle of statism, however, the state emerged not only as the principle source of economic activity but also as the owner of the major industries of the country.